If you were to make a list of the best beginner dirt bikes, a two stroke KTM trail bike would probably not be very high on the list, if it makes it to the list at all. The KTM enduro lineup includes some amazing dirt bikes, but they're meant to be competitive bikes, not beginner dirt bikes. There is, however, a new addition to the 2015 KTM lineup that can definitely find a place on more than just a few beginner dirt bike lists. That bike is the new KTM Freeride 250R. There are several Freeride models on the market, but only the KTM Freeride 250R is available in the US. The Freeride E and the Freeride 350 are not available in the US at this time. The Freeride 250R is a two stroke gas-powered dirt bike, the Freeride 350 is a four stroke gas-powered dirt bike, and the Freeride E is an electric dirt bike. The info in this post pertains to the KTM Freeride 250R. It's an enduro bike, right? The new Freeride 250R is a bit tough to classify. It's part trials bike, part enduro bike, part trail bike and at times it almost seems to be part mountain bike. In short, the Freeride is a completely new kind of dirt bike that may find a niche with many beginning riders. The Freeride is a two stroke, but it's a very well behaved two stroke (that almost sounds like an oxymoron). The bike isn't meant to be ridden at full-throttle down a wide open trail. It's designed for a slower, more technical type of riding which is a great way for beginning riders to learn the basic dirt bike riding skills. Its lower seat height (36") and lighter weight (204 lb) are also beginner-friendly elements. The MSRP for the Freeride 250R is a very competitive $7899. 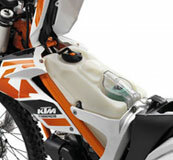 The Freeride has many of the same components of other KTM trail bikes, such as a Trail Tech enduro computer, headlight, taillight, and kickstand. The fuel tank and air filter are located under the seat and are accessed by flipping up the hinged seat. The fuel tank itself is opaque so you don't need to open the gas tank to see how much fuel is left, and the air filter is easily accessed and well protected. One item it doesn't come with though, is a spark arrestor which is a necessity if you plan to ride the bike on public forest lands. The US Forest Service already had the Freeride listed in its Spark Arrester Guide even back in the Spring 2013 bulletin, but they have the 350 listed not the 250. Visit the KTM Freeride page for more pics and info. Although the Freeride was built from the ground up as a new type of dirt bike, it helps to have another dirt bike to compare it to as far as size and weight. If you visit a KTM dealer he's more likely to have an XC-W in stock than a Freeride so at least you can get a general idea of the size. The following info is the 2015 KTM Freeride specs vs the 2014 KTM 250 XC-W specs. Some of the specs were omitted in consideration of readers using mobile devices (plus - do beginners really need to know things such as the bike's steering head angle? ).